As stated in the previous post, my plan for this rainy weekend was baking three cookie recipes from Martha Stewart’s annual cookie magazine. I did two of them yesterday, finishing the third today. I’m happy to say all turned out well: The three were good-looking, tasty and worth the effort … and I can heartily recommend making them yourselves. I’ve titled this post the way I have because I made changes to the recipes, and I’m not sure Martha would approve … she doesn’t seem like the type to brook departures from her formulas. Anyway, here are pictures and short notes on each, including my changes. INDIAN-SPICED CASHEW-LIME COOKIES: These spicy, exotic little nuggets are gorgeous and jewel-like. Redolent with cardamom, and with a tart lime glaze, these are cookies that would go great with a cup of hot tea. The Martha recipe recommended a pinch of red mukhwas (a fragrant Indian breath freshener made of seeds and spices), and we easily found some at a local Indian sweet shop. 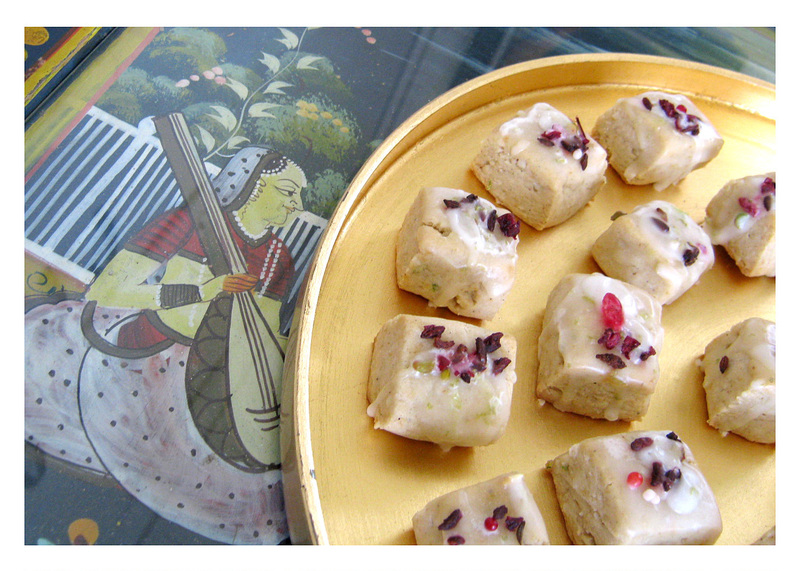 I didn’t use the mukhwas on every one of these cookies but it added a spicy/flowery/perfume-y touch, as well as interesting color accent, to the ones I did. I increased the amount of lime zest to the glaze, for additional tartness and I think it worked. I found the dough too stiff to manipulate as the recipe indicated, so I simplified the cookie’s shapes, also … I will definitely bake this recipe again! 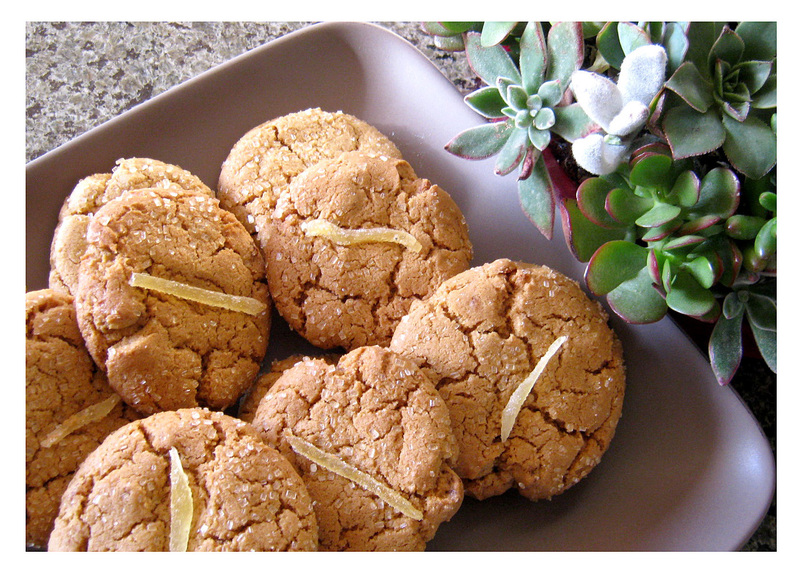 SMOKY BACON-GINGER COOKIES: I was intrigued by the ginger-bacon combination, as well as the use of unsulfured molasses, in this recipe. All are strong flavors, but I thought they’d play nicely together, and they did. The cookies were rich, with a very subtle pork-y flavor that complemented the spiciness of the ginger, as well as the pungent molasses. My main deviation from Martha’s recipe was excluding the sprinkle of smoked sea salt at the end. The basic recipe already included salt — and bacon is salty and smoky as well — so I left it out. I also let them bake longer than recommended, to produce a crisper end product. My cardiologist has forbidden bacon, so I had only 1 of these cookies, but I loved every crumb. A strong cup o’ Joe would stand up nicely to these hearty boys. 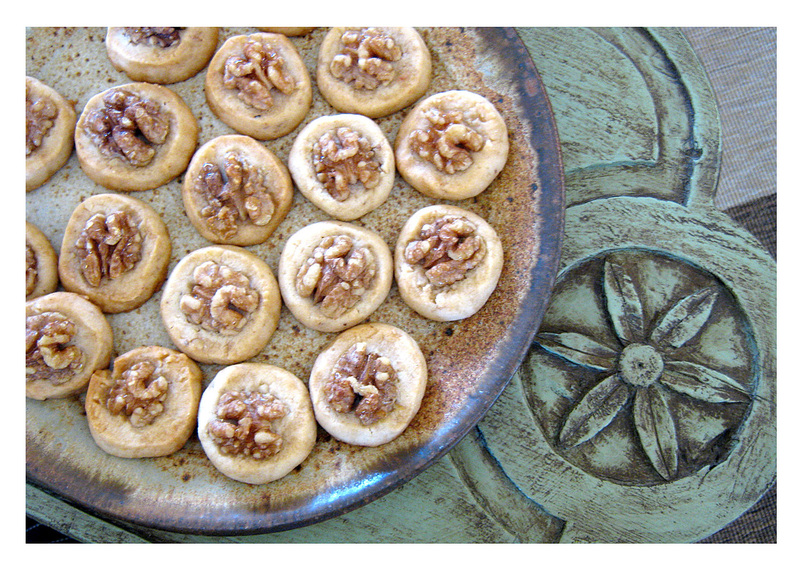 HONEY WALNUT COINS: The simplest of the three recipes, I had to taste the combination of toasted walnuts and Riverside-appropriate orange blossom honey … and, it’s a combo that really works. Nutty, sweet, and nicely rustic-looking, these cookies would also pair nicely with a cup of tea. Martha’s recipe indicated brushing honey on at the end, but I couldn’t get it to go on evenly. I drizzled it on instead. Plus, I wasn’t able to find full walnut halves at the supermarket, so I bought two large bags of walnut pieces, pulling the intact halves out for some cookies, and using smaller pieces on others. I hate when my cookies look nothing like the pictures in the magazine (surprised? ), but I had to get over it, since there was no way I was going to crack my own walnuts for intact halves. These cookies are delicious! If Martha’s people are smart they will find this post and thank you for the PR! Your pictures are mouth watering!!! The reviews are in: the faves were the spiced Indian cookies, with the bacon-ginger close behind! I can NOT find my copy of the recipe for the Indian cookies!! They were our faves too!